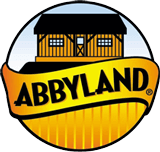 Harland Schraufnagel opened Abbyland Foods, Inc. Abbotsford, WI for business October 4, 1977 as a custom beef processing plant and retail store. A sales force was added to sell meat products to other retailers in central Wisconsin. By the end of 1979 Abbyland had grown to 12 employees and proudly displayed our logo on a refrigerated straight truck making deliveries across Wisconsin into Minnesota. Today, Abbyland, Inc. has over 1000 employees working in 8 divisions. Abbyland Foods manufactures a wide variety of cooked meat products in state-of-the-art continuous oven lines in addition to our traditional fresh and smokehouse sausage products. Abbyland Specialty Meats is a sales division expanding our private label and co-packing opportunities. Abbyland Beef is a slaughter and boning operation supplying the industry with boneless beef. Abbyland Pork Pack is a slaughter and boning operation supplying the meat industry with pre-rigor pork. Abbyland Hot Wraps manufactures bagel wrapped sausage sandwiches for retail and food service. ‘Dem’ Bones smokes and dries bones for pet stores. Curtiss Travel Center consists of Abbyland Family Restaurant, Ambest Affiliated Convenience Store with truck stop facilities, and El Norteno Mexican Bar and Grille. Abbyland Trucking proudly displays our logo on 155 refrigerated semi-trailers delivering our products across the United States. Abbyland Distribution Center opened in 2013 and will be able to help Abbyland Trucking to accumulate customer’s products and haul more LTL orders for companies in the area. It will also serve as a major center to load production as made at the Distribution Center, Abbyland Foods, and Abbyland Pork Pack facilities and combine all orders LTL orders from Abbyland Companies with the outside orders for fill loads.